Capstone Young Readers, 9781479551774, 1pp. 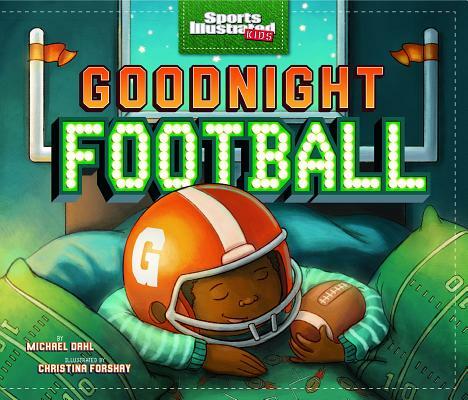 From the opening kick off to the final whistle, Goodnight Football will bring the excitement of a football game to the youngest fan. The rhyming text, vibrant illustrations, and gentle ending will capture the love of the game through a child's eyes. A celebration of football, friendship, and family. This book is sure to be a touchdown for every football fan. Michael Dahl is the prolific author of the bestselling Goodnight Baseball.. He has won the AEP Distinguished Achievement Award three times for his nonfiction, a Teacher's Choice award from Learning magazine, and a Seal of Excellence from the Creative Child Awards. He has also won awards for his board books for the earliest learners, Duck Goes Potty and Bear Says Thank You! He currently lives in Minneapolis, Minnesota.